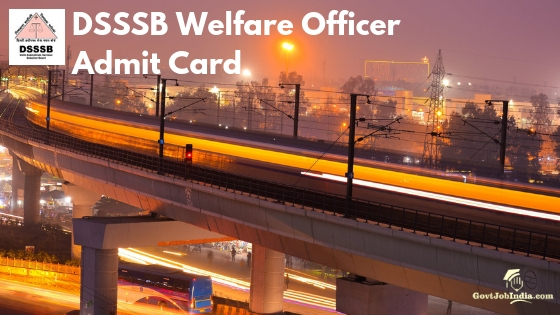 DSSSB Welfare Officer Admit Card: DSSSB Welfare Officer Admit Card 2019 will soon be released after the online applications are closed. The State Commission will officially announce dates and details regarding call letter release date. Please check the official Delhi Subordinate Services Selection Board website @ delhi.gov.in. DSSSB Admit Card Release Date will soon be out and available right here. Candidates are requested to bookmark the page. Both Tier 1 and Tier 2 examinations will be considered for the Hall Ticket. They will be added right here. A direct link to download Call Letter will be made active as soon as they are declared. The selection procedure for 7 different DSSSB posts includes the Tier 1 and Tier 2 exam. Shortlisted candidates from Tier 1 will proceed to appear for the Tier 2 test. Please go through our syllabus & exam pattern article linked below. We have also attached the Commission advertisement Pdf below. In case there are any queries or doubts regarding DSSSB Admit Card 2019 please enter them in the comment section below. Go through the recruitment table provided below so that you can quickly gather vacancy details. The Delhi Subordinate Services Selection Board has not announced admit card release date yet. Once we get hold of it candidates will surely be able to see the same on this page. Please note that the advertisement will be declared on the home page of the official website @ delhi.gov.in. Applicants would need to sign in as per the login credentials and download admit card. To know more on the same please scroll down this page. You will find steps on “how to download DSSSB Welfare Officer Admit Card Online”. We have also attached the direct link to download call letter. Once it is announced by the commission, you can simply click on the “CLICK HERE” option. Selection procedure for 204 vacancies basically includes 2 stages. That would be Tier 1 and Tier 2 examination. A Skill Test or Endurance Test might be added as per the vacancy requirement. Every post/vacancy comprises a separate educational qualification and experience as well. Go through our recruitment article linked below. It has all the important details and dates available as per 7 posts declared. Subjects and topics included in both Tier 1 and Tier 2 examination are almost the same. They would be a bit advanced for the Tier 2 test. Tier 1 examination will be a selection round for Tier 2. Only shortlisted candidates will proceed towards the Tier 2 exam. Post that would be a skill test if required. Kindly check the DSSSB Advertisement attached to know more. You can also go through our syllabus article. They are all provided below in the “important links” section. How to Download DSSSB Welfare Officer Admit Card Online? Official website @ delhi.gov.in will declare the official notification to download DSSSB Admit Card 2019. The advertisement will be declared on the home page for which the link is mentioned below. As soon as you click on the welfare officer or other applicable post a separate web page will open. Select required options like Tier 1/Tier 2/ Skill Test / Endurance Test as applicable. After that enter your date of birth, password, and type the visual code to sign in. Download Admit Card and take multiple print outs if possible so that you do not miss them at the examination center. Do not forget to carry Call Letter with an identity proof at the exam center. Please let us know if there are any doubts or queries regarding DSSSB Welfare Officer Admit Card 2019. Feel free to enter them in the comment section below. Our team will surely get back to you with answers. As the exact dates or notifications are not released, few details might be missing here. As soon as they are out, you can get them right here. To apply or check on more Government Job opportunities check our website govtjobindia.com. There are many options as per various locations, sectors, and academic qualifications. All the best!